Exhibiting at trade shows are an excellent way to market art for licensing. This article discusses the preparation needed to exhibit at shows and includes links to other useful articles. Those exhibiting at the 2011 Surtex, National Stationery, and the International Licensing shows in the next several months may not be able to take full advantage of all the tips in this article but at least some should be helpful. Preparing for any show is dependent upon choosing the right one to exhibit at. Each show has a different focus and thus attracts different manufacturers although there is definitely some overlap. It is important to select what type of industry (paper products, home decor, etc.) your art fits the best and choosing the show those manufacturers attend so that it is worth the cost and time to exhibit. For instance, if you create patterns and images suitable for the scrapbook industry, the CHA show would be a good fit. Read "Art Licensing Trade Shows" for information about the different shows that are just for licensing or resale trade shows that include licensing areas. Note: Many licensing experts suggest that you walk (attend) the show the previous year before exhibiting at it. That way you will know what to expect and get ideas for booth set-up. Beside selecting what show to exhibit at, additional preparation before the show needs to be done. And some of them should be done at least six months before the show. See the following list. 1. As described above, select what show to exhibit your art. 2. Sign up for the show and check to see what is included in the cost of the booth. Some shows give the option of selecting different table and chair heights. Note: The exhibitor pays for additional lighting and extra furniture or supplies their own. 3. Make airline and hotel reservations as early as possible for the best prices. 4. Select what art will be shown on the walls of the booth, in the portfolio(s) and any other materials such as product examples. Also select what size portfolio or multiple portfolios and how the art will be displayed (8-1/2 by 11 inch binders, larger art folders, catalog rack, iPad etc). Note: Many artists and agents are using banners to display art instead of individual pictures. 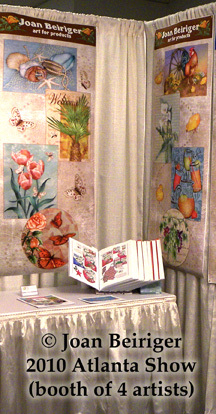 Read "Art Licensing Resource: Using Vinyl Banners for Booths" for more information. 5. Choose what kind of marketing materials that you will give out to the manufacturers and either have them printed or print them yourself. They can be business cards, postcards, 8-1/2 by 11 inch tearsheets, etc. Read "Art Licensing Resource: Using Postcards to Market Art" for a list of companies that print reasonably priced postcards and business cards. 6. Many shows (including Surtex) have press centers where exhibitors can drop off their press kits. To find out about press kits, read Tara Reeds "Not sure what to put in your Press Kit? Here are five things not to forget." Note: Some artists do not put press kits in the press center because they think that more artists take them than publishers. 7. Prepare your "elevator speeches" as Tara Reed is fond of saying. These are short statements (two or three sentences) telling the manufacturer (many times the art director) about your art, asking what products they manufacturer and the kind of art fit their needs, giving a definition on what is art licensing for those uninformed manufacturers, etc. Examples of elevator speeches are in Tara's e-book "How to Maximize Your Time and Investment in Trade Shows." Believe me, once you have a couple of elevator speeches down pat you will be a lot less nervous in talking to manufacturers and art directors. 8. Select how you will keep track of art directors interest in your art. Some artists use separate printed forms that has space to enter pertinent information (name, contact info, type of products manufactured, art interest etc. ), or separate blank pages, or notebooks. 9. Art directors often quickly flip through your art and tell you to send them certain images for licensing consideration. Figure out a way to identify your art quickly so that you can write it down. Some artists have each piece of art numbered so that they can write down those numbers while others put colored stickers on the art in the portfolio to identify the manufacturer's interest. It is too difficult to write down a long description of what art to send (example, yellow daffodils with purple pansies in a vertical format). 10. Make appointments with manufactures that will be attending the show. Having a list of clients that you are already in contact with helps. Normally the booths that are the busiest during the show are the ones that have made appointments. Of course, you will bring your booth art and other materials, your portfolio (s), and marketing material to the show. But you should also bring tools and other supplies for setting up the booth. Read metal sculpture artist Karen Rossi "Trade Show Tips" for a suggested tool kit. Note: Airlines allow most household tools that are less than seven inches long in carryon luggage. However, be prepared to open the luggage so that security can check the size of the tools. For some reason, my luggage is always checked. Hint: A great tip from art licensing agent Suzanne Cruise is to bring a small stapler and pen (each attached to thick string) that can be hung around your neck. That way they are always handy when you need them. I purchased mine from an office supply store. Wear "business" clothing at the show. Check out the 2010 Surtex video to see what type of clothing exhibitors wear. Note: Many exhibitors wear black or combinations of black and white but I do not look well in black so I wear brown. Hint: Wear comfortable shoes. You will be doing a lot of standing. When you exhibit you should look approachable to manufacturers and NOT bored. To do this you need to smile a lot, do not sit down unless you are helping a customer look through your portfolio, do not eat in the booth, and do not be so engrossed in reading a book or literature that you do not often look up. Are those hard and fast rules? Absolutely NOT! But, they do help make you more approachable. For more information and another artist opinion on how to present yourself at a trade show, read metal sculpture artist Karen Rossi "Trade Show Tips." And for other suggestions and tips read art licensing agent Lance Klass of Porterfields Fine Art Licensing "Are You Planning to Exhibit at the Javits Center in New York for the Very First Time? Here are Some Tips!" Most importantly, after the show is over you need to follow up with all the contacts you made during the show as soon as possible! Read "Art Licensing Tip: What does follow-up really mean?" The following is a list of helpful e-books, audio teleseminar, and a series of classes about exhibiting in trade shows that can be purchased on Tara Reed's blog site. During the past year, I have heard many artists and agents rave about how great the iPad is in displaying art at various licensing shows. A friend showed me her art on the original iPad and I was very impressed with the color and clarity of the images. But as an artist who licenses art, just the ability to display art is not what really "sold" me on purchasing an iPad. What sold me is that it is an all-in-one device* that can be used for an amazing number of tasks. It is portable and holds a charge for ten hours, relatively light (about 1-1/2 pounds) that can be carried everywhere, an adequate size touchscreen (5-3/4 by 7-1/2 inch viewing) so that text and art are very readable, ability to enlarge text and art with finger movements, ability to rotate the screen orientation by moving the device, and connects to the internet via Wi-Fi or Wi-Fi plus 3G with AT&T or Verizon provider. Read more about the iPad 2 on the Apple website. * A device such as the iPad and iPod is a computer that has limited memory to run an application. Device apps (applications that do not take much memory) can download single files but they are dependent on a larger computer such as a Macintosh to do more complicated computer functions such as organizing music in iTunes and pictures in iPhoto. Once organized the music, pictures, and video folders are synced** from the computer to iPad by using iTunes software. Apps loaded onto the iPad can do tasks to allow the user to download movies, video podcasts and music one at a time onto the iPad and also allow the user to read e-books, view movies, listen to music, and MUCH more. ** sync means synchronize. Computer files and apps in iTunes and iPhoto are downloaded to the device and the ones on the device are uploaded to the computer and thus the files on the computer and on the device are synced. iTunes allow the user to sync all or only the ones chosen in each category (books, music, photos, apps, etc.) For instance, the user can choose only a few of the iPhoto albums she/he wants synced to iPad or choose all them. Right now the iPad 2 is in such great demand that they are still difficult to find even a month after the March 11 release. I finally purchased my own black, 64GB iPad 2 three weeks after the release date by using an online website that tracks the iPad 2 inventory at Target and RadioShack stores. I had to drive 30 miles to purchase it at Target but I felt it was well worth the drive. Note: I could have ordered an iPad 2 from the Apple online store and waited for it to be delivered. Or I could have stood in line each morning at the closest Apple retail store 11 miles away (40 minute drive) in the hopes that they had received the one I wanted. There are many apps available (many are free) that can be used for fun and business. I have only check-out a fraction of them but have found some very useful ones. Later blog articles will discuss iPad apps. 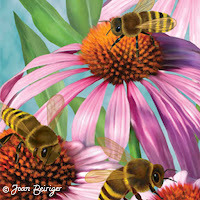 Read the following comments on how I plan to use the iPad in my art licensing business. The internet can be accessed with Wi-Fi or a 3G (AT& T or Verizon provider) depending on the model purchased. Wi-Fi is a wireless internet connection available for free in many coffee shops, restaurants , public libraries, motels, etc. Some hotels, cruise ships, and private businesses charge for the use of the Wi-Fi service. A 3G service is a wireless satellite internet connection. The user pays the provider a monthly fee to use the service. An iPad with a 3G AT&T provider can have access to the internet all over the world but the Verizon version can only access the internet in the United States. Using the iPad is a great way to connect to the internet and receive e-mails when you do not own another device. Now that I have an iPad I do not have to lug my Mac Book computer on trips just to receive e-mails. Showing art to potential licensees (manufacturers) at a trade show is an excellent way to market art. The art can be organized in iPhoto albums on the computer and then synced to the iPad with iTunes. Manufacturer art directors can quickly look at the art by flipping through the albums and even enlarge images on the pages to see the art better. 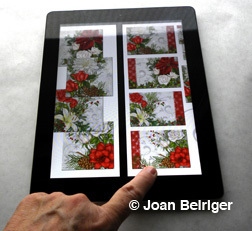 Read "Licensing Artist goes "high tech" in Surtex Booth" on how artist Donna Gelsinger's son Jesse used an iPad at the 2010 Surtex show. e-Books can be downloaded and read with free downloadable apps such as iBook (Apple.com - iTunes store), Kindle (Amazon.com - Kindle Store), Nook (BarnesandNoble.com - Nook store) and even as Adobe pdf files. I have purchased some excellent art licensing e-books in pdf format by artist Tara Reed and plan to re-read them on the iPad 2. I also have pdf handouts from some of the art licensing seminars that I have taken from Jnet Smith of All Art Licensing and other business seminars. Many manufacturers have pdf catalogs of their products which can be downloaded from their websites and be used as reference material. However, these pdf catalog files are large and tend to be memory hogs so I do not plan to download many to my iPad 2. There are many free books in the iTunes iBook library including iTunes University (iTunes U) that can be downloaded with the iPad. It includes some interesting business books and even a biography of Desmond John an investor in the reality TV show Shark Tank. Other e-book stores also have free e-books that can be downloaded to the iPad. Another source for e-books and other electronic media is the public library. By using the ID on a library card, a person can access and checkout electronic materials (e-books, audio books, and music) over the internet. Depending on the system the library uses some material can be downloaded while others must be read or listened to over the internet. A popular free app library e-book downloader and reader is called OverDrive Media Console. Note: After the checkout time expires for the media, access to it is lost and the media must again be checked out. Side note: Because the Kindle e-book reader uses proprietary software, it cannot download most library e-books. An iPad can be used for listening to music, to audio books and to audio art licensing conferences*** with the iPod app that comes with the iPad. Audio files can either be downloaded to the computer via the internet or transferred from purchased CDs to the computer, placed in the iTunes application on the computer, and then synced to the iPad. I plan to listen to all kinds of audio files on the iPad while exercising on my treadmill, doing repetitive household chores, on airline and car trips, and waiting in lines or for appointments. Note: The iPod app opens in the iTunes format so the file can be selected, volume controlled, etc. ***Some of the Ask Call series of art licensing teleseminars moderated by artist Tara Reed are free and others can be purchased. Watching videos, movies and podcasts on the iPad is a great viewing experience because the picture is clearer and colors brighter than many computer monitors. I found that viewing Photoshop video tutorials on the iPad is much better than my monitor because the tools and command bar on the screen is actually readable. The iPad 2 has a rear and front camera with apps that takes pictures, make videos, do video calls and make funny wacky pictures. So far I have only taken a couple of pictures and created a short test video. I am not impressed with the resolution of the pictures taken with the iPad 2 but the movie resolution is good. My digital camera takes better pictures so I probably will not use the iPad 2 for regular picture taking. I think the main purpose of the cameras on the iPad 2 is for making video calls and video conferencing with the Apple Face Time video app but there is at least one app that I found very useful that takes advantage of the camera. Read my comments about Adobe Idea app (for drawing pictures) in the Creating Art area of this article. Hint: Taking iPad 2 videos can be used for art inspiration and also used as a marketing tool. Demonstrates on art techniques and upload to www.youtube.com is one way to get you and your art noticed. And videos taken of special or everyday events such as cute gamboling puppies and kittens can be used for inspiration in creating new art. Photos from digital cameras can be download via the camera SD card or directly from the camera via a USB cable to the iPad 2 by purchasing the iPad Camera Connection Kit. All the pictures on the SD card can be downloaded or selected ones chosen. The photos appear in event folders in the Photo app on the iPad. The iPad could be used to temporarily backup the SD card or free up space on the SD card depending on the remaining amount of memory on the iPad. There are many apps that allow the artist to doodle, sketch and paint with the iPad. Having the ability to paint and sketch digitally any time or anywhere I wish is amazing. Most of the apps are limited in capability and some are awkward to use. However, I've found two apps that I really like so far. I've doodled a little with the ArtStudio app ($2.95) and it has an astonishing number of tools for an app. Its capabilities are similar to Photoshop and the art as raster images can be exported as psd files so that additional painting and editing can be done in Photoshop. Note: The use of the tools and commands are different from Photoshop so there will be a learning curve before mastering it. The second app that I like is Adobe Ideas. It is free for the one drawing layer and one photo layer version or $4.99 for up to ten layers. Adobe Ideas allow an artist to sketch with vector tools. The bottom layer is used to display a photo from the iPad Photo library or a picture taken with iPad's Camera app so that the artist can explore creative ideas, sketch design concepts and jot down notes on the photo. The drawings can be emailed as a pdf file and the sketched vector images can be edited in Photoshop or Illustrator. Listing brainstorming ideas for new art, jotting notes to remind yourself to do something, and creating to-do lists are good ways to get organized and track tasks. The iPad comes with a Note app that is somewhat limited and must be typed which takes some getting use to on the small key pad and super sensitive touch. Other apps allow the user to hand write notes. Note: Files do not have to stay on the iPad but can be e-mailed to yourself or printed. Documents can be printed wireless via AirPrint with the iPad. The iPad automatically locates and connects to the computer enabled printer on a Wi-Fi network and the user can easily print e-mails, photos, and internet website pages. Using the iPad has been a journey of discovery for me with a lot of verbal WOWs. It is an amazing device that does SO many things. The only negative that I have with it is the high cost but I am so glad that I invested in it! Readers and I welcome your comments about the iPad and how you use it or plan to use it. Click on comments at the bottom of this article and write your comments in the comment window.